Short circular needles by ADDI. If you dislike using DPNs, try these! They are handy for knitting small items for babies, larger socks and jewellery. 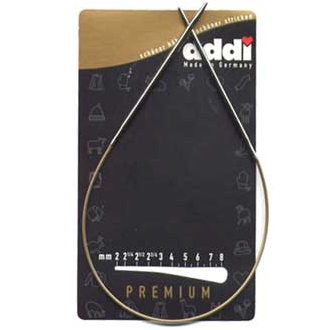 Top quality, wonderfully shiny and smooth and easy to use, the ADDI Turbo knitting needle is so popular! 30cm is the total length from tip to tip. The length of each tip is 7cm. The length and size of needle is printed on the cord, so you cannot get in a muddle! Especially designed with the sock knitter in mind - short needle tips for ease of use.